Here is a short summary from the Q2-FY18 Earnings Call Transcript of a few selected stocks. 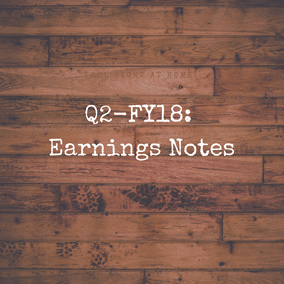 The sole objective of this post is to provide a quick short digest of disclosures relating to the company that came to the forefront during the earnings call. Over the course of this quarter, we intend to keep an eye out for the transcripts of other companies as well. Do share your feedback/ improvements/ suggestions in the comment section below or reach us on #general in Slack if you are a premium member. Note: Capitalmind does not take any responsibility of the accuracy of the information provided by the management of the company. Analysts may have positions in some of the companies mentioned here. Please assume we are biased. Settling claims speedily – the insurer settled 99.98% health claims within 30 days in Q2 FY2018. First call resolution of customer calls stood at 85.4% in the most recent half yearly period of H1 FY2018. Solvency ratio was at 2.18x at September 30, 2017 as against 2.03x at September 30, 2016. Loss ratio in Motor segment has improved from 81.4% to 78.7% during H1FY18. In H1 FY2018, 92.8% of motor OD claims were surveyed through use of tablets. The insurer has a well-diversified portfolio comprising of Motor insurance at 38%, health and personal accident at 17%, crop insurance at 25% and property at 20% of GDPI [Gross Direct Premium]. ICICI Lombard’s – largest total investment assets among the private sector non-life insurers in India at Rs. 167.63 billion as on September 30, 2017. Investment leverage (net of borrowings) was 3.93x at September 30, 2017. The company does not foresee re-insurance rates hardening in global catastrophe market on the back hurricanes in US. A better picture will be made available when the negotiations happen with the reinsurers in Q4 this year. Proportionate Arrangement – for every Rs.100 of premium that the company sources, they reinsure 75% of the risk on a proportionate basis. So that is a complete risk transfer that happens out of ICICI Lombard and the losses are made good by the reinsurers. For this risk transfer on a proportionate basis, the company gets a commission on reinsurance which is used to defray the cost of acquisition. On the balance 25%, the company has entered into a non-proportional arrangement or a stop-loss reinsurance arrangement which triggers at a loss ratio of 110% and goes upwards up to 250%. So at any given point of time, in the event, if the portfolio was to exhibit a loss ratio of let us say 140%, so far as ICICI Lombard is concerned, the company would be taking the impact of losses only to the extent of 110% of losses, which is 10% of loss higher than the premium that the company retains and anything beyond that would be made good by the reinsurers. ROE impact of the Motor Vehicle Act – company expects an improvement of ROE. However, given the difficulty as to how the market with adjust to this new bill, the company has not accounted for this in the current model. Health Insurance Segment – company is focussed on retail health segment and is looking to reduce its exposure on the government-sponsored health insurance scheme [last year the mix stood at 44% for retail, 34% for corporate which is group health and 21% for the government-sponsored health insurance]. In Q1 the government-sponsored health insurance business was brought down to 2.4% and is now close to zero in Q2 [company had to let go off almost Rs.2 billion of premium from the government sponsored health insurance scheme since it had a high loss ratio]. Company is also witnessing improvement in underlying market dynamics for corporate health insurance scheme. Business support services and sales promotion have grown by 37% YoY for Q2 – due to addition of certain new distribution areas along with increased intensity in the market in terms of the cost of distribution. Increase in Crop Insurance business from 7% to 25%. The industry has grown at about 113% for Crop Insurance for five months [because last year was the first year of the Pradhan Mantri Fasal Bima Yojana where the entire market expanded significantly]. For ICICI, in the six months the business has grown about 36.6% and from a diversification perspective, the company is looking at 25% by the end of the year. Profit decline was in lines as the management had indicated earlier specially about the pressure on business in the U.S [US generates 35% revenues, India generates 30% revenue though India sales is not as profitable as America itself] on account of consolidation of the trade partners and price reduction. Amazon coming into the pharmacy market and potentially becoming another major customer is a positive for the company as this allows the company to get an additional channel into the market now that 90% of the market is with the 3 biggest customers. Speciality business has declined by about 15% principally because of pricing pressure as well as due to the loss of exclusivity on Glumetza and Fortamet [additional blow came from the impact of Claris One and Metformin erosion in Q1 continuing into Q2 for which the company lost exclusivity and had new competitors considering its a $5 million to $6 million a month product for the company]. On an annual basis company expects price erosion in high single digit for the US business alone. Company was aided by tailwinds in terms of Forex and R&D spends which were lower at 12.2% of sales. And R&D figure run rate will be in the range of Rs. 500 crores on a quarterly basis. Forex impact on profitability stood at Rs. 42 Crores in Q2 against Rs. 72 Crores in Q1. On the FDA inspections for Goa and Pithampur – company is looking at a 6-9 month timeframe so as to reach closure of the audit observations. Company has EIRs for other plants including Aurangabad that had observations along with the other blocks in Indore which were inspected [On 7th November, the company was notified that the warning letter for these facilities stands true]. Management is looking at 15% growth for Q3 and Q4. However, coupled with the disruption of Q1, a target of 12% to 15% is reasonable. For FY 2018-19, management is looking at 21% to 23% in terms of margin and revenue growth. Company is looking at close to 30 filings for the current year including some FTFs. by Q4 but is also looking at a good meaningful opportunity in the next financial year. On Tiotropium, company expects the trial to end by end of this fiscal year. Levothyroxine is a pretty complicated and large bio study. There are lot of other barriers for other competitors to come in like – need to be very efficient in the manufacturing process, it is not the fanciest priced product and since it’s a very old product in the market, not everyone is interested. Launches scheduled for FY19 – Axiron later this year with a full-year impact in FY-19, Ranexa is another major one for next year. 2 controlled substances launched in the last month or so. Full impact of Hydrocodone/APAP will be seen next year as well. Generic TOBI – Tobramycin approval came very quick and the company was not ready to launch the product due to the agreed lead time with the contract manufacturer. Launch slated for Q3. MCIE India has grown higher than its key customer namely M&M, Maruti, and Tata Motors both in 3Q 2017 and over the first nine months in C 2017. MCIE’s dependence on Engine and Transmission parts in Passenger Vehicles that may be affected if Electric Vehicles become a larger part of the Auto industry i.e. 10% of MCIE India business and 25% of MCIE Europe business could be affected by EVs (as per management). A very strong traction seen in the European division [Metalcastello plant] due huge project of €15 million turnover per year awarded by an American customer, Caterpillar. In Lithuania the growth is seen from the installation of a new Crankshafts Line, Press Line, Complete Line as the supply of these Crankshafts [size of contract at €5 million – €6 million] start to kick off to Volkswagen. On the significant increase in Electric Vehicles talks in EU – company believes that the Electric Battery Vehicles are not yet developed to give the range and even the infrastructure even in Europe is not there for example the absence of plug-in infrastructures in Europe. Company is looking to boost business as most vehicle manufacturers look at Hybrid vehicles i.e. vehicles with both Electric Motor and also an Internal Combustion Engine.